Most emergency energy bars get the job done, addressing the caloric and nutritional needs of the average person. These basic requirements can be fulfilled simply by packing calories and nutrients into a compact edible food, but there’s one aspect that energy bars consistently fall behind on: taste. Millennium Energy Bars are different. These life-sustaining bars contain a healthy mix of essential carbohydrates, fats and proteins in a compact form, and they are so good you’ll forget they’re not a snack food. U.S. Coast Guard-approved, these bars are popular among professional travelers and adventurers because of their effectiveness and easy storage. These high-calorie emergency food bars clock in at about 400 calories each, so by only eating one, you’ll be getting all the nutrients a full meal offers! By replenishing your energy with quality ingredients that won’t dehydrate, you’ll increase your strength and ability for survival. 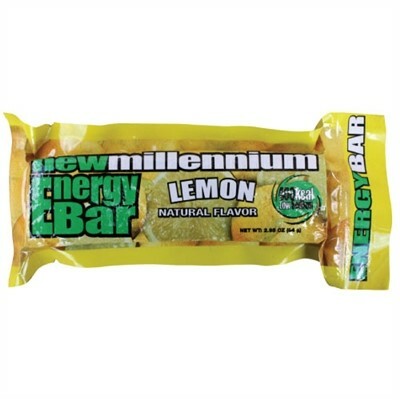 With a shelf life of up to five years, Millennium Energy Bars can be stored away now in the event of a disaster later. Keep them in your car, in hiking packs or designated emergency storage containers. 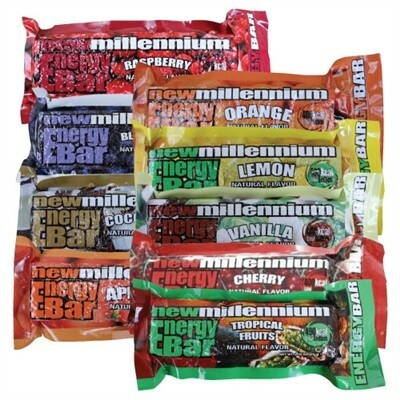 Unlike some long-lasting energy bars, Millennium Bars are lightweight and maintain their consistency in and out of the packaging. Because they were designed to withstand extreme temperatures, you don’t need to worry about how and where you’ll store this emergency food. Some energy bars can melt, leak or spoil in hot cars or storage areas. 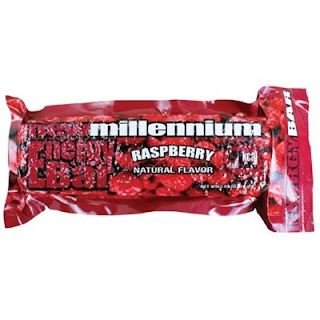 Millennium Energy Bars will last and remain flavorful and edible no matter where you store them. Millennium Energy Bars are available in several different flavors – raspberry, blueberry, coconut, apricot, orange, lemon, vanilla, cherry and tropical – and each of them offer delicious nutrition without the added unwanted extras. Once you decide on a flavor, you can buy individually, order a nine-bar combination pack or stock up completely with a case consisting of 144 bars. We can’t predict the future, but we can prepare ourselves for the possible. No matter if you’re trekking through the mountains, camping in the wilderness or simply in your home during an emergency, you might find yourself in desperate need for food. When it comes down to it, there’s no better food bar to rely on than the Millennium Energy Bar. Other products don’t compare with its lasting durability, shelf life and great taste. This product has been proven effective time and again to provide nutrition and calories without sacrificing taste. At SOS Products, we carry every Millennium Energy Bar at a great price to make sure you’re prepared for the unexpected. Browse through our store today, and find the right emergency bar for your needs!